Keyboards (pianos, synths, MIDI controllers, accordions) are very popular musical instruments; a plethora of them has been devised through the ages. Much to the dissatisfaction of an amateur performer, the equipment is often bulky and unsuitable for practising while travelling (think instead of the convenience of a flute or a recorder). I decided to run a little analysis to check if such chimera exists: *a keyboard which can be used to play a reasonable amount of musical literature, while also being travel-friendly*. To get a feeling of what range the music I play is, I consulted the excellent Open Hymnal Project (PDF): chorales are harmonically pleasing, have a number of different voices (usually four) and there are many of them. As a bonus, the OHP not only does provide its Hymnal as a PDF, but in ABC notation format too; this allows for simpler data processing. then we check the lowest and highest note (highlighted in red: B♭ and E♭). The distance in semitones between those two notes is the measure we are looking for (in this case: 30 semitones). 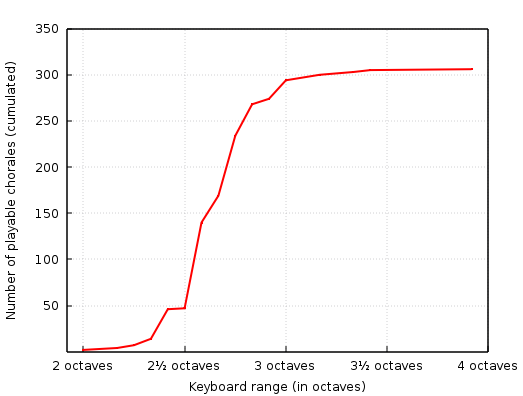 It is clear how a two-and-a-half keyboard won’t cut it and how a four-octave one is a waste: most of the chorales (294/306 = 96%) are playable on a three-octave keyboard. This is because the starting note in the layout matters (and indeed picking C is particularly ill-conceived if portability is a plus). Here I tabulated all the possible 3-octave keyboard layouts by starting note. Again, the comparison concerns on the number of playable chorales (out of 306). Starting on E and F is the best choice; replicating the analysis on other collections (Frescobaldi, Bach, Palestrina) showed a slight advantage of F-to-F over E-to-E. The playable-chorales percentage drops from 96%, but it is still high (87%). This was common knowledge in the past: small keyboard instruments (like this clavichord) started on F to accommodate more music on less keys. a melodica: no need for a PC/electricity/cables, also comes as a standard in the above mentioned superior F-to-F layout. A hose mouthpiece allows two-hands playing. Weight is attractive too, floating around a kilogram or less for most melodicas. a MIDI keyboard: MIDI controllers are ubiquitous nowadays, allow silent practising and a much wider selection of sounds than reeds. 37-keys ones dance (length wise) on the edge of the IATA specifications, so check for ones without mod-wheels or beefy chassis. Much to my dismay, most three-octave MIDI controllers come with the C-to-C layout; this strongly limits the playable repertoire on the instrument. A solution is to shop for the (uncommon but existing) F-to-F layout, but if you are ready to invest in your musical education, learning how to transpose at sight is an option. You mentally shift each note up by a fourth (i.e. playing an F when you see a C written on the score) while instructing your controller or software to lower the output by a fourth (a feature present in every MIDI keyboard). I am practising this skill and, despite requiring mental effort, it is not as difficult as it sounds. I plan to dedicate more time to it and then write an article on how to best approach the matter. Playing interesting literature on a small, travel-friendly music keyboard is possible. Happy travelling light everyone!